In this new L.A., we must also rethink our past polarities. We can promote entrepreneurship and raise the minimum wage. We can allow for higher density and raise the quality of everyday life. We can take away lanes for cars and improve our ability to move across this city. We can revitalize distressed areasand work against the displacement that redevelopment often induces. It’s a big package of stories with a lot to read. If you’re sitting/standing/waiting/stuck on transit, check it out. Disclosure: I shot some of the photos that accompany the articles. 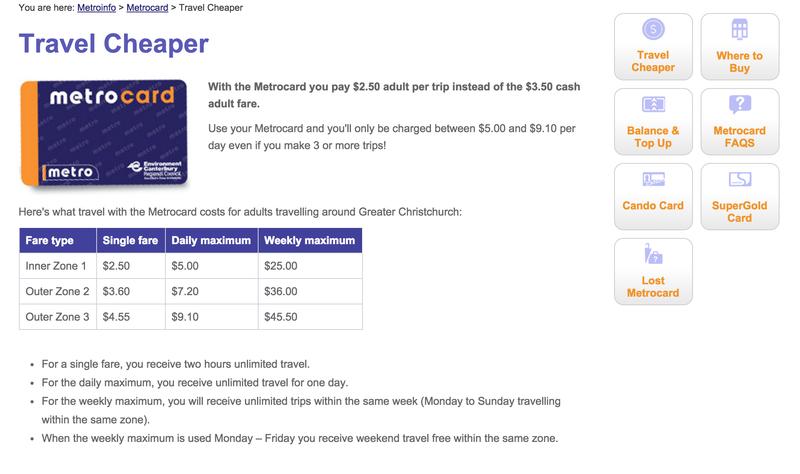 A screengrab from the Christchurch Metro website explaining its pass fare structure. Instead of purchasing daily or weekly passes, you simply use your fare card as an e-wallet and pay for each trip directly. When you reach the spending cap for the day, any additional trips you take that day are free, exactly as if you’d purchased a day pass—but without the requirement that you pay for all your rides up front. The weekly caps work in exactly the same way. What this means in Christchurch is that if you take transit to work and back throughout the week, you hit the cap by Friday evening and transit is effectively free for the weekend—not very different from buying a weekly pass on Monday and using it throughout the week. But if you fall ill on Thursday and miss work for a couple days, you end up paying just $15 for the week, saving yourself $10 on bus or train rides you aren’t able to take that week. Shane argues that this approach is better than the current set-up, which requires riders to purchase their passes before using them. That can be tough for many people who are price sensitive as they may not be able to afford buying something that they may not use. I’m unaware of any major transit systems in the U.S. that do what Shane is proposing or if the current technology would support it. But it’s an interesting idea and I thought readers here may like to give it a chew. Not your average college campus! Credit: 20th Century Fox. 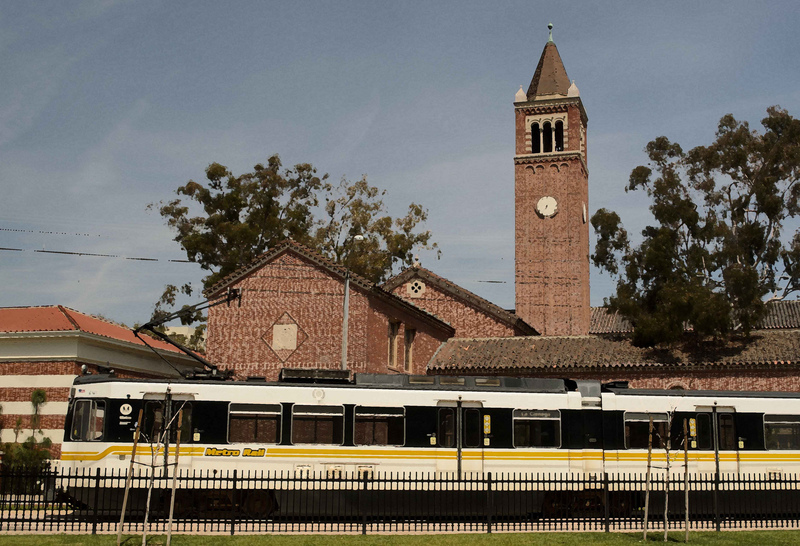 Transit subsidies “somewhat mitigated USC’s image as the Death Star, just a corporate, soulless place,” said Lisa Schweitzer, who studies transportation and environmental issues as an associate professor at the college’s Sol Price School of Public Policy. 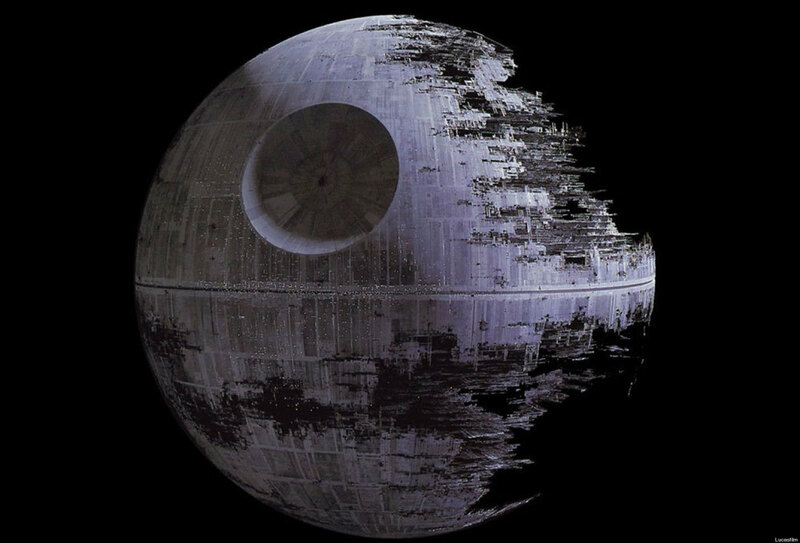 Death Star? Her words, not mine! As the story also reports, this was done as a money-saving move and it’s not certain how many USC employees will stop buying passes without the discount. Putting aside all that, here’s my PSA: For those interested in taking transit to or from USC, there are three Expo Line stations adjacent to to the campus — and USC showed some real Fight On in getting that Expo Park/USC Station during the project’s planning phase. There are also numerous Metro bus stops near campus, including the 81, 102, 200, 204, 442, 550 and 754 Rapid (maps and timetables here). The Los Angeles Memorial Coliseum — where the famous USC football squad plies its trade — is an easy stroll from the above stations. If you’re an employer and would like more info about Metro’s transit subsidy program, click here. Metro will be seeking to meet the agency goal of 35 percent affordable units at joint developments the agency is pursuing at seven locations. This is part of a program to take a more holistic approach to development on properties the agency owns — and extending some of those strategies into surrounding neighborhoods. All the details are in this staff report below and the pilot sites are on page 10. 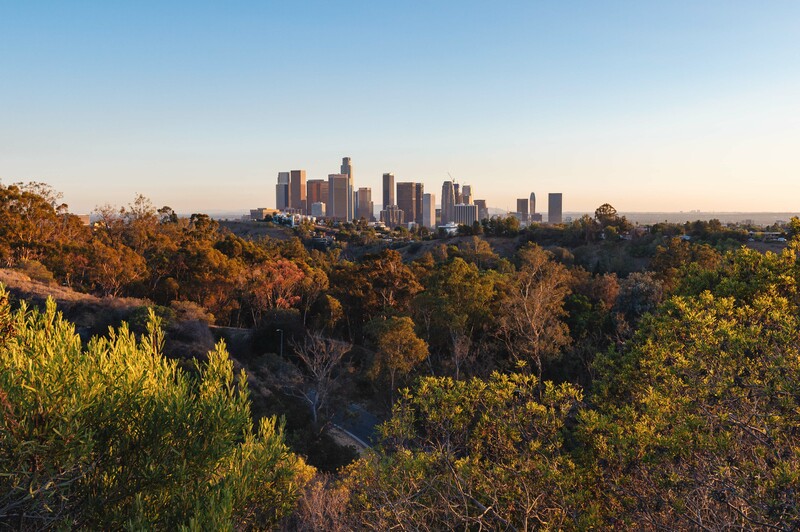 You’ve probably heard that L.A.’s transit system is growing. Young people are embracing urban life, renting lofts in the Arts District and selling their cars so they can take public transportation. And L.A. leaders are adapting to give them what they want, providing WiFi at bus stops and building new rail lines faster than any other city. There’s one problem with this story, and that’s that ridership is actually dropping. Yes, at a time when employment is up, and the rail network is growing, fewer people are taking buses and trains. Gene talks to a couple of Metro staffers to get their take. One says that allowing undocumented immigrants to get California driver’s licenses likely ate into ridership. Another notes generally flat or lower bus ridership in other parts of the state (and in the country, in fact) and some service disruptions due to maintenance on the rail system. I’ve mentioned before several other factors that may be at play: an increased crackdown on fare evasion in the past year, the latching of turnstiles at some Metro Rail stations, last year’s fare increases, a stronger economy and see-sawing gas prices. I’m sure the service interruptions for maintenance work and breakdowns is a turnoff for some riders. Another thought. As part of its long-range plan update and potential ballot measure work, Metro’s messaging will likely be along the lines of we’ve come a long way but still have a ways to go in terms of building a 21st century transportation network in L.A. County. I think that’s accurate messaging. I suspect the current transit network may not be as fully ripened as some would like it before using it more frequently. Hopefully some of the projects underway — the Crenshaw/LAX Line, Expo Line 2, Foothill Gold Line, Purple Line Extension and Regional Connector — will remedy that. Metro posts its monthly rail estimates here. And here is a Source post from earlier this year about efforts at Metro to boost ridership. Programming note: I’ll be away until Wednesday, meaning the keys to HWR will be in my colleague Joe Lemon’s possession. RE: Pay as you go transit. If I’m not mistaken, this is the same system as London’s Oyster Card. But even if it isn’t any novice programmer could make this work on Metro’s Tap Card system. It’s not rocket science. With the new office of innovation, I hope switching to a “capped fare” sort of system is even more possible. L.A. can spearhead this in the U.S. It makes sense right? Pay for your use. Eliminate overpaying if you don’t ride enough for daily, weekly, or monthly passes. In the meantime, maybe Metro should try creating passes that can last three, six, or twelve months or establish a sort of incremental payment mechanism. A lot of folks can’t afford to plop down $100 a month on one day for passes. The New Zealand fare structure cited above isn’t much different from what many have cited examples for some time now: automatic price caps, in which Metro has cited as impossible to do for whatever reason. Of course, the fact that when pointed out that London runs with zonal system and fare caps in place using the same exact Cubic system as Los Angeles does somehow returns odd silence from Metro. I have little doubt that the technology would support a Christchurch-type solution, anywhere that uses a contactless transit card, and probably most systems (e.g., New York City) still on magnetic transit cards. A transit pass is a bet. As a transit pass user, you are betting that you will, before it expires, use it enough that you pass the break-even point. And the transit authority is betting that you won’t. This gives you a strong incentive to take transit, even when shoeleather would suffice (and on my recent vacation, I did just that, breaking even on my Ventra card [Chicago] and my MetroCard [NYC]; in Philadelphia, which still uses tokens, but seems to be rolling out the equipment for a contactless system, I took some pretty long walks in order to “come out even” on tokens). A Christchurch-type system would be less lucrative for the transit authority, because the system would be, in effect, giving its riders the benefits of a pass without the risk of “not breaking even.” And in our present political environment, with politicians climbing over each other to demonstrate transit-hostility to their big oil sponsors, few would have the political courage to support the increased subsidies necessary for a Christchurch-type system. A transit system is not a lottery or a gambling casino. The best interest of its riders (taxpayers) is more important than the best interests of the agency. Considering that LA has one of the lowest farebox recovery ratios in the US, let alone the world says that the current model isn’t working for Metro anyway. Agreed, that a cap system has been mentioned in the past along with distanced based fares. There is nothing impossible about doing either or both at the same time with the technology available today. So it seems like you’re actually the one that’s best informed on this matter. Who in the US uses it? But the best interests of the riders are not served if farebox recovery becomes so low that those who oppose public transit as a thing in itself have an excuse to get rid of it entirely. And the Christchurch system can only lower farebox recovery, because it effectively gives away all the advantages of a pass, without the rider having to commit to paying for a certain number of rides whether he/she uses them or not. But the question is, how do YOU know for certain it will lower farebox recovery? What do you base this on? “Gut feel” that it isn’t going to work and nothing else? Are you an expert in transit fare studies? London uses the exact same fare capping system along with a zone-based system and it has a 90% farebox recovery ratio, far more than LA or any US transit agency can hope to achieve. Again, where do you base this information from? Christchurch, NZ has a 35% farebox recovery ratio rate which is 10% better than LA Metro (25.5% as of 2015). That being said, looking at the two examples of London and Christchurch, it seems that the fare capping system works working along side a variable zonal based system works better than our flat rate or pre-purchase a pass system that we use. Can you prove otherwise with facts and data that backs up your claims that it won’t work? You are making a wide reaching assumption on things that have very little to do with each other. London has much higher fares in general. Just a fact that can’t be disputed. People still flood the system because you essentially can’t drive in much of London very easily. Gas is much more expensive, parking is non-existent and there is a high fee just to enter the center of London. If fares were to go to London’s level in LA, ridership would drop as people would just drive as gas is cheap here, parking is mandated almost everywhere and in all new construction. Pretty much only the poor ride in LA. Just saying that because they have fare-capping or distance based fares and have higher recovery ratios is pretty simplistic thinking at best. Metrolink has distanced based fares and has long struggled with farebox recovery and is constantly having to raise fares to keep their recovery near their mandated 50%. So that being said, let’s compare Hong Kong and London then. Hong Kong has distance based fares that start off much cheaper, in the 50-60 cents range (4-5 HKD) and yet manages an astonishing 180%+ farebox recovery ratio (solely from fares, not from other revenue sources like real estate), which is double the 90% farebox recover ratio of London. But what can be deduced from this is that London with their expensive zonal system which start off at $3.50 (£2.30) still requires 10% of their system to be funded with taxes despite their riders paying a high price for it. Hong Kong manages to actually make a PROFIT out of running transit with cheaper distance based fare rates. Now you can try to say that London is bigger than Hong Kong, but you can’t then answer the puzzling fact that Hong Kong is about the same area size, population density, population, and high ridership numbers as New York, but New York can’t achieve a farebox recovery ratio of over 50% despite constant flat rate fare hikes. So I guess that suggest that the clear winner in the best way to run transit is Hong Kong: distance based fares that start off really, really low, in the cent range, to encourage many riders to use the system for shorter trips. Sounds like this plans would work best then here in LA where the vast majority of Metro riders are poor and do not do much long trips then, wouldn’t you say? So using that, then what Metrolink is doing wrong is that they need to be REDUCING their distance based fare prices, not increasing them if they want to see a higher farebox recovery ratio. As for Christchurch, a simple Google and Wikipedia search shows that it’s only a small city that barely has 375,000 people living in it. It’s pretty ridiculous to compare Christchurch and Los Angeles, but it does point out that Christchurch still manages to get a better farebox recovery ratio than LA under a capped zonal structure over a flat rate structure, despite lower population and likely, lower ridership numbers. One thing a lot of people seem to be overlooking is what might be the potential benefits for Metro on their TAP card operations if they choose to end pre-purchase of passes and go to automated fare caps. The TAP card system can be streamlined significantly because Metro wouldn’t have to set up all these different passes at their TVMs and online at taptogo.net anymore. Everything will be just as simple as load up cash value and let the system do all the work. The entire operations will be easier and simple both at the TVM and online with less confusion of things like a day pass, a 7 day pass, or a 30 day pass. Less longer lines at the TVMs is better too because the only option on the screen that people have to pick will just be “add cash value” and that’s it. It’ll also level the playing field toward low income riders who may not be able to plunk down a $100 for a monthly pass in advance. Generally, the person who purchases the $100 monthly pass benefits the most if that person is a power user of the system, but this means it only benefits the ones who can also afford to pay $100 a month in advance. And there’s absolutely nothing, no guarantee that a daily, 7 day or a 30 day pass will remain at current rates either. The more these passes gets a fare increase, the more it hurts the low income riders. If the passes are gone and the cap system is put into place, then it essentially becomes a pay-as-you-go system, much closer to how other utilities are run. And since public transit here is regulated by the California Public Utilities Commission and is treated like a utility for whatever odd reason, why then should public transit fares become similar to how we all pay for natural gas, electricity, and water? Put it another way, LADWP or Southern California Edison doesn’t allow us to “pre-purchase” a fixed amount of electricity “monthly pass” so that we have to we sorta-kinda-someway-don’t-ask-me-how have to figure out how much kilowatt hours we plan to use way in advance to use, right? You can’t tell how much kilowatt hours you’re going to use in a month or two; it’s impossible. You’re not going to be able to tell if there’s going to be a major power outage that can last over a day or you may be called to an extended business trip in which electricity won’t be used at your place of residence for some period of time. The same thing as transit. You can’t tell a month or so in advance how you’re going to be using it. Fare caps should be done and if it will become an option here, I’d support it. I’ve made this comment before when the question of price caps came up: capping only works with fixed time periods, not rolling periods. So we can (and should) have a cap to replace Metro’s day pass, but we can’t have a cap equivalent for the 7-day pass. London offers a prepaid pass for any 7-day period (just like Metro), but the comparable price caps are done on a calendar week basis (Monday–Sunday). Ron, what’s the reason that a rolling fare cap period isn’t possible, or not feasible? A “rolling system” cap is perfectly doable. The private sector is capable of doing this, and one example I can think of is how wireless phone carriers are able to use a “rolling period” caps on data plans and airtime minutes. A person can choose to add more high speed data/week and that too is capped off and is not a fixed “week” either. If the private sector can figure out how to do rolling caps on data and airtime minute plans for millions of wireless subscribers across the US, surely Metro can figure out how to do rolling caps on fares for millions of Metro riders in LA.